From NC State University Extension. Instead of disposing of yard trimmings and kitchen scraps, you can compost them in your own backyard. Composting is an easy, fascinating, and natural way to recycle. Compost can be made from most organic materials such as leaves, kitchen scraps, and yard trimmings, and it can improve the health of your soil and plants. You can be as involved as you like with your compost pile: simply stack things up and wait for nature to take its course, or turn, water, and monitor the pile to speed up the process. When mixed with soil, compost increases the organic matter content, improves the physical properties of the soil, and supplies essential nutrients, enhancing the soil’s ability to support plant growth. Compost can also be applied to the soil surface to conserve moisture, control weeds, reduce erosion, improve appearance, and keep the soil from gaining or losing heat too rapidly. This publication explains how to build and maintain a compost pile and use the compost in your yard and garden. Organic materials that can be composted are commonly characterized as “browns” and “greens.” Browns are sugar-rich carbon sources (carbonaceous) that provide energy to microorganisms, absorb excess moisture, and provide structure to your pile. Browns include dead fallen leaves, newspaper, straw, sawdust, napkins, cardboard, twigs, hay, dryer lint, and bark. Greens are protein-rich nitrogen sources (nitrogenous) that provide moisture to microorganisms. Greens include grass clippings, vegetables and fruit, coffee grounds, tea leaves, livestock manures, and alfalfa. Table 1 provides examples of organic materials that may be added to your compost bin. Table 1. Examples of organic materials that can be composted. You can store food scraps in a container until you are ready to add them to your compost pile. Some people freeze food scraps in a container; others reuse a plastic container with a lid, or use a purchased compost kitchen container, and keep it under their kitchen sink or on the kitchen counter. Food scraps should be buried inside the pile to avoid attracting rodents. Yard waste suitable for composting includes fallen tree leaves, grass clippings, straw, and non-woody plant trimmings. Although grass clippings can be composted, it is better to leave them on the lawn where they will decay and release nutrients, reducing the need for fertilizer. (See Cooperative Extension Service publication AG-69, Carolina Lawns.) When adding grass to a compost pile, mix it thoroughly with leaves so it does not compact and restrict airflow. Newspaper and other types of paper can be composted, but the nitrogen content is low, which decreases the decomposition rate. If paper is composted, it should make up no more than 10% of the total weight of the material in the compost pile. It is better to recycle paper curbside or take it to a community collection site. Set up your compost pile or bin in a convenient location that is more than six feet away from your home or wooden structures. To help it retain moisture, place it in a shaded area within reach of a garden hose. The location should be a flat, open space that is protected from flooding or runoff to surface waters or wells. Keep the areas in front of and above the pile or bin clear so you can work without difficulty. You do not need to use a bin to compost. Some choose to use a bin to keep the pile neat, help retain heat and moisture, or because they live in a neighborhood where a bin would be more appropriate than an open pile. Many people make their own compost bins using concrete blocks, wooden pallets, wire mesh, 55-gallon drums, or garbage cans. Others construct a three-compartment wooden bin using plans from the Internet. There are a variety of manufactured composting bins available, including enclosed, spherical, or tumbler styles. Although meat, fish, bones, and dairy should not be added to a compost pile or bin, they can be placed in an in-ground digester such as the Green Cone. 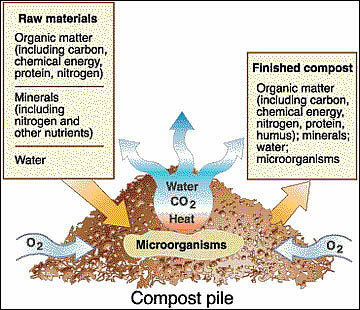 There are two basic styles of composting: (1) single batch, where you add materials all at once to form a pile; and (2) continuous pile, where you add organic materials as they become available. Build your pile three to five feet high and at least three feet in diameter so it can become self-insulating to retain heat. Add four or five inches of carbonaceous materials (browns), then two or three inches of nitrogenous materials (greens), and keep alternating the layers. Another method is to thoroughly mix up browns and greens during loading. Be sure to thoroughly water each layer to ensure even moisture distribution. Toss in a handful of soil on each layer to introduce more microorganisms. Top the pile with four or five inches of carbonaceous materials to prevent flies and other pests and provide a filter for odors.